With the summer's cereal harvest safely gathered in, and stored in granaries, September was, in many cases, the time to bring out harrows and ploughs to prepare the ground for the sowing of the next crop, often winter vegetables, such as cabbages or turnips. 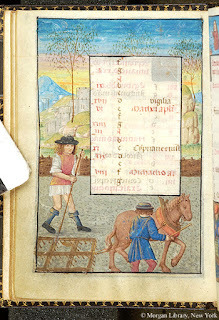 Harrowing, c 1490, Pierpoint Morgan Library Manuscript 5.7 f D09v. 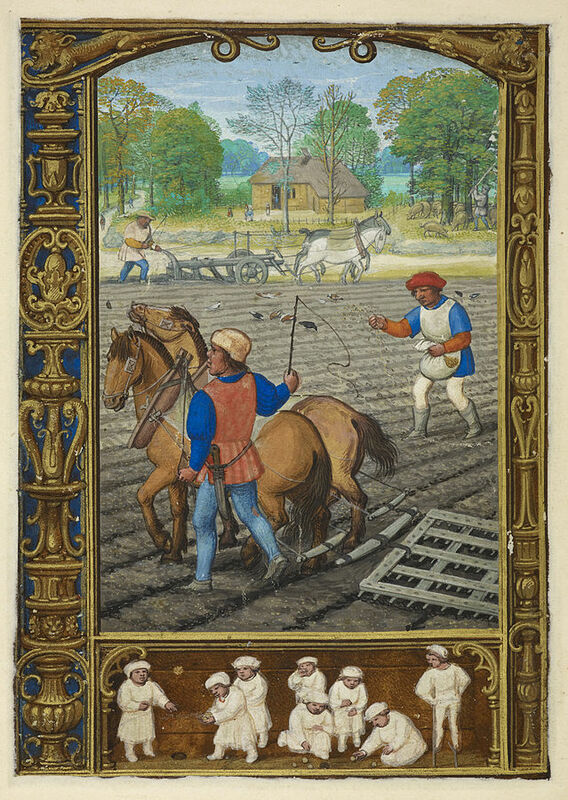 Harrowing (foreground) and ploughing (background), from the Golf Book, Bruges, 1520-30, British Library, Add.MS. 24098, f26v (licensed under CCA). 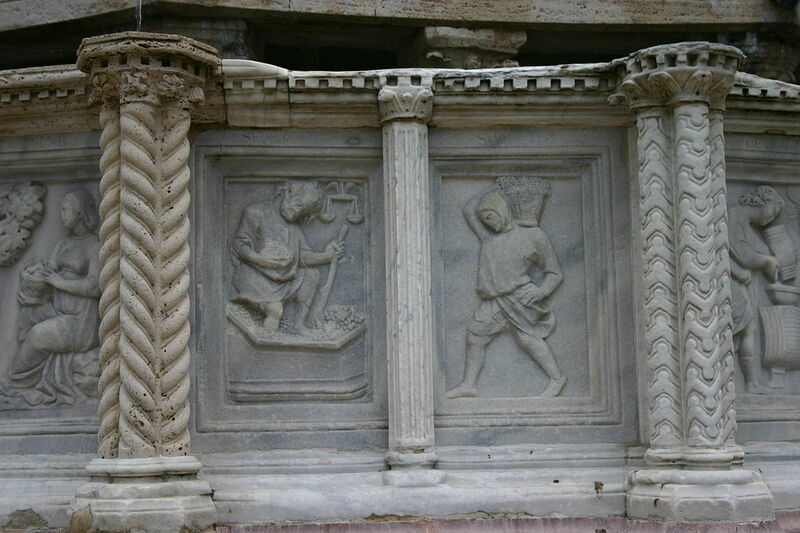 The men in the lower panel are playing a game with marbles. 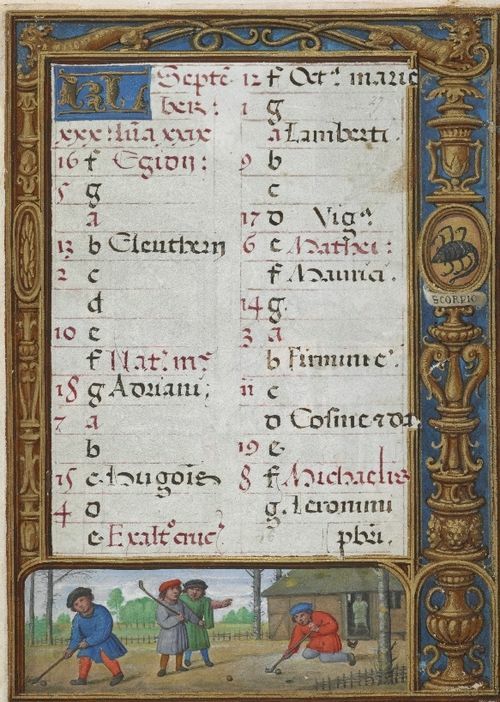 There does appear to have been at least some time for recreation, for the early Sixteenth Century "Golf Book" takes its name from a marginal scene in one of the pages for September, depicting a game that, at least superficially, resembles golf. 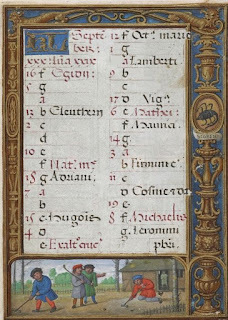 Calendar page for September, from the Golf Book (details as above). 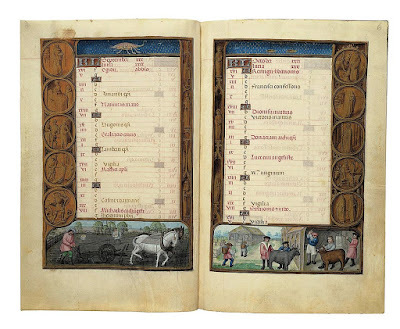 The men in the lower panel play a game resembling golf, whilst the zodiacal symbol for Scorpio appears in the right-hand margin. 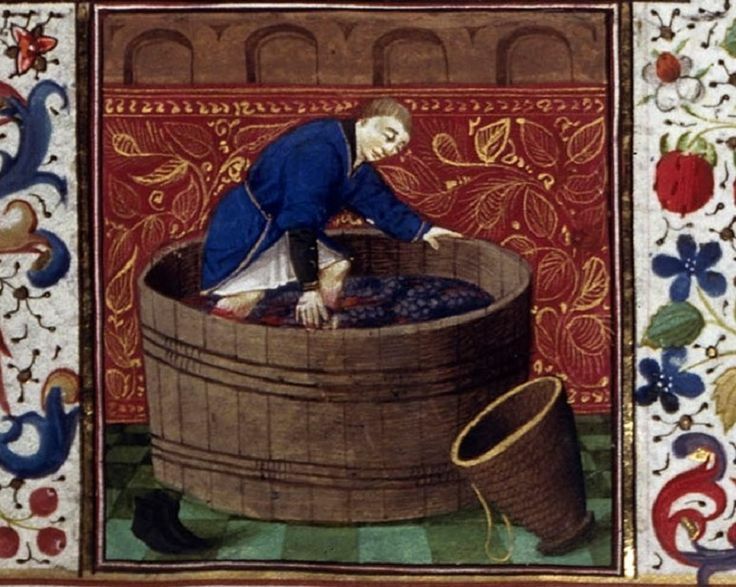 In wine producing areas, September was often the month in which the grapes were harvested. 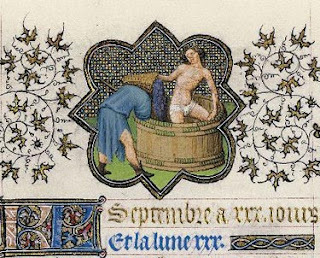 Scenes in books of hours, on stained glass, and even, sometimes, on stone fountains, show the cutting, treading, and pressing of the grapes. 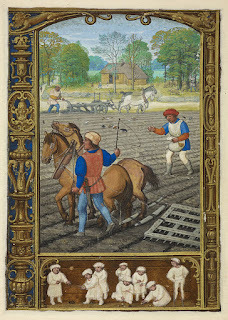 The grape harvest, from Les Tres Riches Heures du Duc de Berry, 1412-86, Musee Conde, MS.65, f9v. 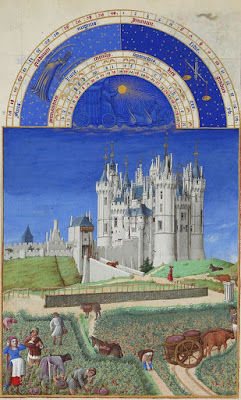 The castle in the background is the Chateau de Saumur: both castle and vineyard are still in existence, the former containing an excellent restaurant, in which the wines from the latter may be sampled! 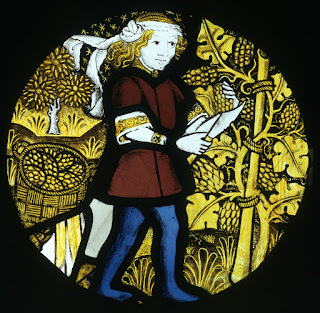 The grape harvest, c 1480, Victoria and Albert Museum C133-1931 (image is in the Public Domain). 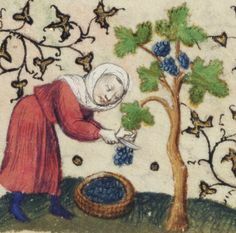 The grape harvest (image is in the Public Domain). 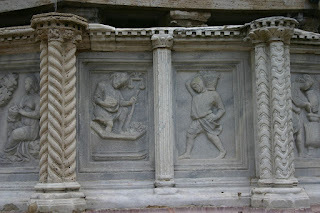 Scene from the Fontana Maggiore of Perugia, c 1275, depicting the harvesting and treading of grapes. Photo: Giovanni dall'Orto (licensed under CCA). 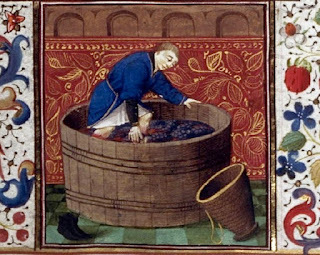 Grape treading (image is in the Public Domain). 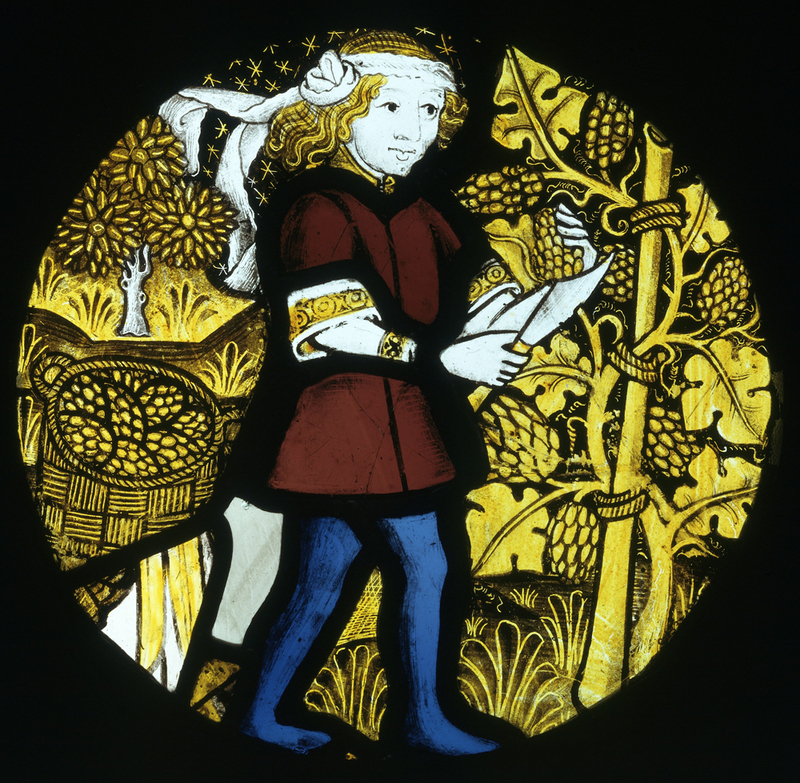 Secular, rather than religious, concerns remain to the fore in September, but each milestone in the agricultural calendar of the Middle Ages also had its spiritual significance: if August's cereal harvest provided the "bread of life" for the Eucharistic feast, September 's grape harvest would fill "the cup of the new and everlasting covenant." Calendar pages for September and October, from the Rothschild Prayer-Book (image is in the Public Domain).